There was a short-lived cartoon in 1998 titled and starring the Silver Surfer. I recall hearing about it before it first aired, and I think I may have caught an episode or two, but it lasted so very briefly that you never hear much about it. I recently stumbled across the entire series being made available for free on Marvel's website and sat through and watched the whole thing. The show loosely follows Surfer's comic book history, with the first three episodes devoted to his origin. The primary difference is that the Fantastic Four aren't involved as Galactus comes to consume Earth, and it's actually Frankie Raye who helps the Surfer regain his humanity, not Alicia Masters. And instead of being trapped on Earth, Galactus instead banishes the Surfer from finding Zenn-La, so he's able to travel the spaceways, but remains a perpetual outsider. The remainder of the series mostly follows his search of his homeworld, with an ongoing subplot of Thanos trying to destroy the universe to win Lady Chaos' favor. The art for the series draws heavily on Jack Kirby's personal style. Many of the character and ship designs are blatantly influenced by him, if not outright lifted. They're generally animated well (for TV) which helps make for a pretty solid internal continuity. However, the instances when designs are not lifted directly (Silver Surfer, Galactus) or indirectly (Thanos, Beta-Ray Bill) but instead were developed evidently exclusively for the cartoon tend to stand out. There's a few alien races here and there that just look like they stepped in from another cartoon. There's also a curious artifact of the show being made in the late 1990s. There was just enough technology that it was reasonable to create the show using a mix of traditional and computer animation. 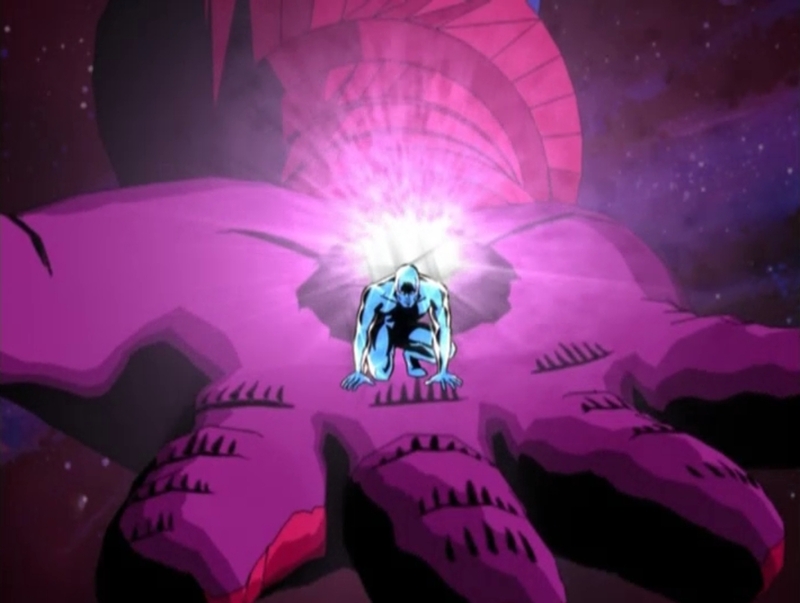 The characters are all old school cell animation, while Galactus, the ships, the space backgrounds and some of the effects were done using 3D rotoscoped images on the computer. Despite including some trademark Kirby squiggles and plenty of Kirby krackle on the designs, the two don't quite mesh together. The figures always seem superimposed on the other elements. Like watching an old movie that used rear screen projection; you get the intent and understand that's what they had to work with at the time, but it's not very convincing. Despite some of the limitations in the visuals, however, the stories were very well done overall. Larry Brody is largely responsible having developed the series, as well as writing most of the episodes. The overarching plot of the Surfer looking for Zenn-La holds the series together well, but also allows for individual episodes to each have their own adventure component to them. Surfer can follow leads about his home all over the universe, and still be pulled aside at any way-station. The characterization of the Surfer is interesting, too, in that he follows some of the early Stan Lee style speeches. There are plenty of sequences in which the character just flies around thinking to himself. It falls perfectly in line with the character, though, I can understand that some viewers might feel that lightens up on the action. The series, on the whole, is more pensive and thoughtful than just about any other Marvel series that I can recall and makes for a refreshing change. The series was cancelled after only thirteen episodes, due to a legal dispute between Marvel and Saban Entertainment and has never been released on DVD here in the U.S. But since it's online, that's not really an issue! Thirteen 20-ish minute episodes with no commericals for free? And it's some well-written, stylish stuff to boot? Why would you not want to at least check this out? I tried watching this show, but it was one of those times when the departures from established Marvel lore just irritated me too much. I gave up after several episodes. (And I also noted the replacement of Thanos's fixation on Death with "Lady Chaos. I can just hear the talk in the network offices about this: "A Saturday Morning TV villain who's a NECROPHILE? No, we don't think so...") It might interest you to know that according to TV Guide the women executives at Fox hated all the Marvel super-heroes except the Silver Surfer. A lady cousin of mine loves him too; there must be something about him that resonates with women. The only thing that annoyed me worse than the Fox TV Silver Surfer was the Fox TV Avengers! THAT was AWFUL! I love the Surfer and will check this out.